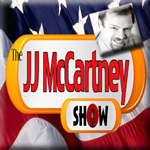 JJ McCARTNEY is the Cure for the Common Show! Please note that we are currently updating the website for The JJ McCartney Show. This smart, daily program combines topical news with a superb mix of guests, sharp wit and the quintessential polished radio pro who simply had enough of the corporate hamster-wheel! We believe in Jesus our risen Lord, and we stand for our Constitution, and the vision of our founders.